This season even the bold hair colours look like they are just meant to be, wether short or long, soft texture is the way forward. Here are our favourite winter inspiration styles. 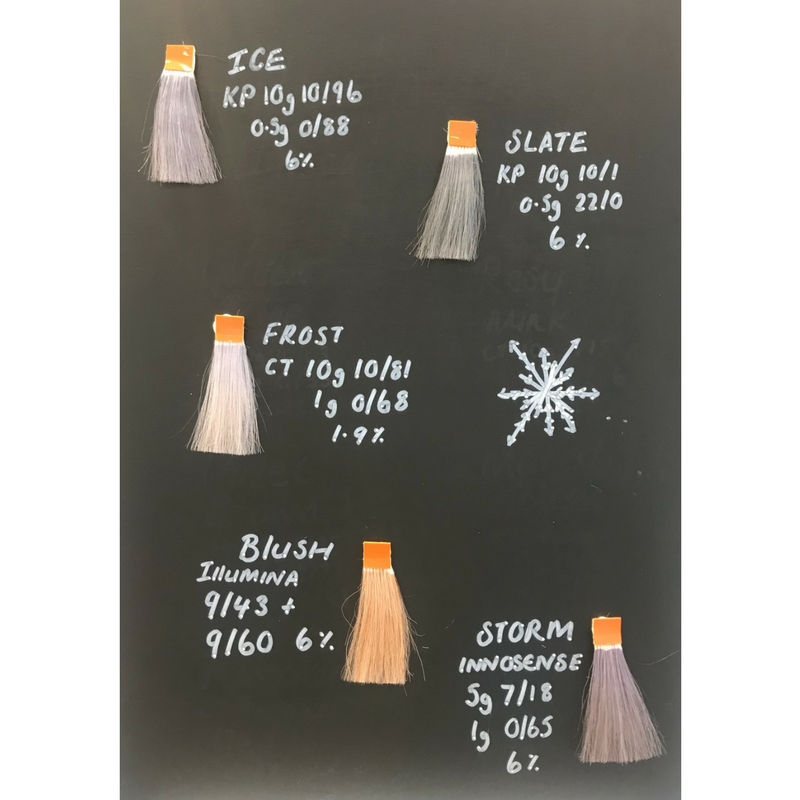 This is the colour pallet to be working with, whatever your hair colour now you can incorporate a little bit of winter into your style. We love this super cool wintery blonde bob. The blunt edge is perfect when styled with a bit of texture. If you are naturally dark, adding a bit of violet looks amazing especially on long hair, style with dry shampoo or texture spray for that matte finish. Or if you’re feeling adventurous mix up the two with this lovely soft blonde with just a hint of blue/violet through the lengths. The short textured fringe adds some interest to a long layered look. Or if lighter really isn’t your thing then this beautiful muted auburn is perfect, it’s warm and rich without looking too artificial, the shorter areas around the face will work with almost any face shape. So there you have it, get booked in for your Winter hair here. Everyones hair needs a little more care attention in the Winter to avoid drying out and getting damaged once the weather changes, here are our top 5 tips to keep your hair looking and feeling amazing through out the Winter. First up, it may sound obvious but don’t go outside with wet hair. Wet hair is much more delicate than dry hair and the cold will make the water swell inside the hair shaft and can cause internal damage to the hair, which will affect the life of your colour as well as the condition of your hair. Regular trims! We know we say it all the time but in the Winter regular trims are important. Your hair will get blasted by the environment with the cold and the wind which causes damage and split ends, so make sure you are getting your hair trimmed every 6-8 weeks. Add a weekly intensive treatment to your hair care routine. Central heating can really dry hair out so replacing the moisture lost in the winter is essential to keeping your hair looking good. Our favourite is Alterna’s Caviar Moisture Masque it’s so luxurious and leaves your hair super soft, shiny and moisturised. Try washing your hair slightly less often, usually in the winter it’s relatively easy to push it another day, this will help keep the natural oils in your hair and on your scalp and in turn keep it all in better condition, also it means you’ll be heat styling your hair less often which is only good news for your strands. Keeping up with these little tips and making that small change to your routine will make the world of difference to the condition of you hair thought the Winter months.